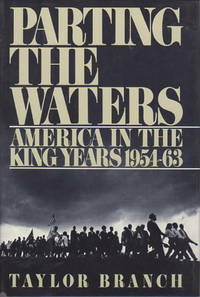 PARTING THE WATERS, AMERICA IN THE KING YEARS 1954-63. New York:: Simon & Schuster,, (1988.). Fine in a fine dust jacket. A massive book, and rather uncommon in the hardcover first edition, and especially so in this condition. . First printing. A comprehensive guide to the early years of the civil rights movement, meticulously researched. Winner of the Pulitzer Prize and the National Book Critics Circle Award. Notes, index. 1064 pp plus photographic plates.